excerpt from her poem Radiophobia. Lyuba Sirota was a writing teacher in Pripyat, Ukraine. She recalls life in the closed city as idyllic, a pocket of intellectuals surrounded by a verdant forest. 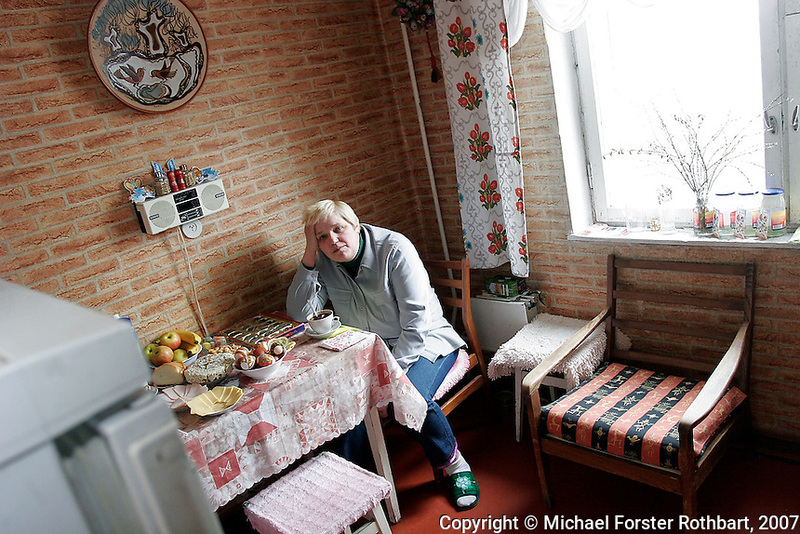 Original caption: .Photo title:.Lunch with Lyuba Sirota..Caption:.Lyuba Sirota was a writing teacher in Pripyat. She recalls life in the closed city as idyllic, a pocket of intellectuals surrounded by a verdant forest. The day after the accident, her son Sasha played with friends on the Pripyat riverbank near the station, unaware of potential danger...Sirota is a poet and historic preservationist. She and Sasha want to save Pripyat from crumbling and turn it into a museum, before looters and weather destroy the buildings that remain. .-------------------.